Our caring staff and low cost spay and neuter programs have made us the most successful spay/neuter clinic in America. We keep the prices as low as possible – less than half of what most veterinarians charge. We offer vaccination packages and discounted pricing for spaying and neutering your dog or cat. Microchipping, dental care, individual vaccines, and other important tests are also available for both dogs and cats. Includes: Rabies, FVRCP, Leukemia plus Leukemia test. Includes: Rabies, FVRCP, Leukemia, Leukemia test plus FIV/Leukemia Test. Includes: Rabies, Distemper/Parvo, Bordetella plus Heartworm test. Heart worm preventative is extra. Please call clinic for spay/neuter pricing for dogs over 70 lbs. * Heartworm treatment & dental cleaning available- call for pricing! 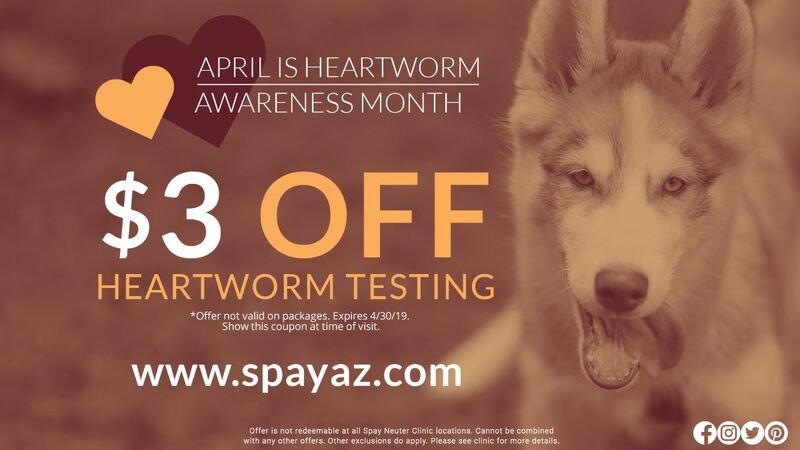 * Heartworm and flea prevention available! Includes a 24-hour pain injection. Pain medication to go home are an additional $15.